The physician and author John Ayrton Paris (1785–1856), several of whose other medical and popular works have been reissued in the Cambridge Library Collection, published the first edition of his Pharmacologia in 1812. It was immediately successful, and went into eight further editions until 1843. The third edition, of 1820, has been reissued in this series. This book, published in 1825, was intended as a companion volume, providing a 'grammar' of chemistry for the medical student. 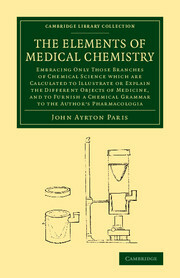 After an imaginary dialogue on the importance of chemistry, between a provincial physician and 'the author', to whom the former is entrusting his son for his medical education, the book moves systematically from the general application of chemistry to medicine, through topics such as gravity, crystallization and electricity, to the detail of the actions of specific elements, and tables of relevant weights and measures, providing fascinating insights into the history of medical education.